(यूपीएससी सिविल सेवा परीक्षा पाठ्यक्रम 2019, आईएएस परीक्षा पैटर्न और पाठ्यक्रम डाउनलोड करें) Every Year, Union Public Service Commission (UPSC) releases the employment notification to fill vacancies for the post of Indian Administrative Service Post (IAS). Therefore the candidates who have already applied for UPSC IAS Recruitment 2019 can now download IAS Exam Syllabus through our website. The organization is going to conduct the prelims examination on 02nd June 2019 and Mains exam on 20th September 2019. Therefore the candidates who are preparing hard for IAS Examination can now go through IAS Exam Syllabus 2019 (आईएएस परीक्षा पाठ्यक्रम 2019) and prepare well for the examination. You can also check UPSC IAS Exam Pattern before going to the exam and at the same time download IAS Exam Syllabus Pdf. 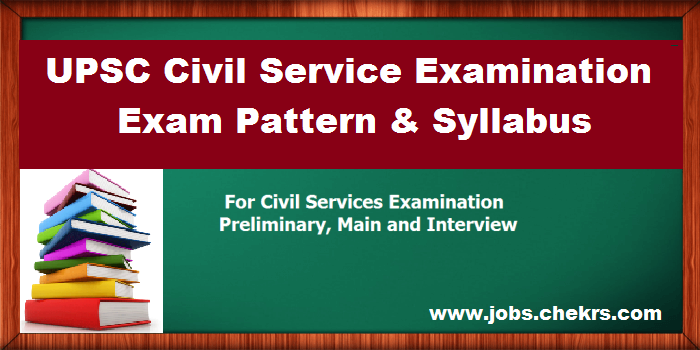 Job aspirants can go through this article and get details of Union Public Service Commission Examination 2019. Latest Update: UPSC is going to conduct the Civil Service prelims exam on 02nd June 2019 and mains exam on 20th Sep 2019. Applied candidates can check the UPSC IAS Syllabus for prelims & mains from here. UPSC CIVIL SERVICES EXAM is popularly known as the IAS exam. Every year nearly 5 lakhs of candidates are applying for this prestigious exam. In this article, we are sharing detailed information about IAS EXAM PATTERN, SYLLABUS & SUBJECTS are given. The Union Public Service Commission consist the two parts of the Civil Service Examination. The Preliminary Examination consists of two papers of Objective type (multiple choice questions) and carries the maximum of 400 marks. This exam is only a screening test; the marks obtained in the prelims are only for qualifying for the main exam and are not counted for determining the final order of merit. In General Studies Paper – II, minimum qualifying marks are 33%. You will be selected for Mains exam based total qualifying marks of General Studies Paper – I. The IAS Mains Examination is designed to analyze the comprehensive intellectual quality and the understanding of candidates rather than just determining their information and memory. The UPSC Mains Exam consists of 9 papers, these two papers just need to qualify which is compulsory and marks obtained will not be considered or counted. General issues on Environmental Ecology, Bio-diversity, and Climate Change – that do not require subject specialization General Science. Candidates can choose the optional subject for the paper-VI and VII. Here we are giving the optional subject list. Candidates who qualify the UPSC Mains Exam will move to the next and final phase called ‘Personality Test’ who will be interviewed by a Board who will have candidates resume. The interview round is held by a Board of competent and unbiased intended to assess social traits and his interest in current affairs and analyze the personal aptness of the candidate for a career in public service. Some of the qualities evaluated during the personality test are mental alertness, clear and logical exposition, critical powers of assimilation, variety, and depth of interest, the balance of judgment, intellectual and moral integrity ability for social cohesion and leadership. The interview is more of purposive conversation intended to divulge the mental qualities of the candidate. With the help of IAS Syllabus provided here, applicants can score well in the exam and get qualified. To receive more updates on UPSC IAS Exam Syllabus, keep visiting our site www.jobs.chekrs.com. We will provide you with the latest alerts on Union Public Service Commission job post and UPSC Exam pattern. In the case of any query or review, you can place your valuable comments in the commenting section below. We will revert you in a short while.